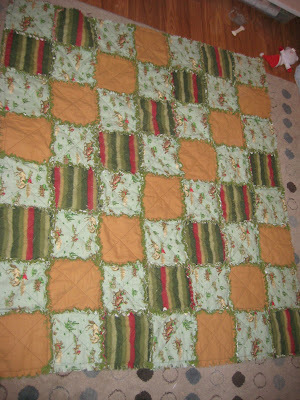 Here is the first one done! I really like it, it is very western. Eric likes it too! 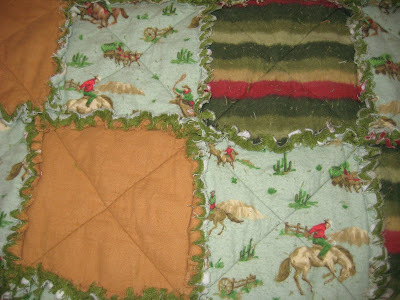 It is not very little girlish but she LOVES horses, and I LOVE the pattern with the horses. It was hard to find stuff to match it. I also LOVE the green on the back, it is such a pretty color. It still needs to be de-balled. 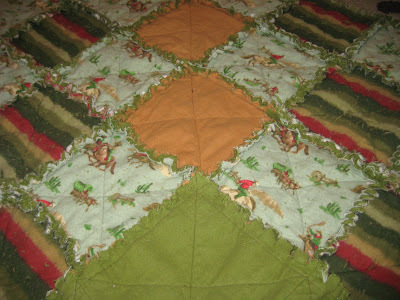 I am done another quilt as well, it is in the dryer, and1/5 done another. That is progress I would say! There is hope! Beautiful!! What an awesome present! I'm sure Auntie Lindsey will be a favorite this year! :) Can't wait to see the rest!